The Sharing Group Discussion: Are All Depictions of the Prophet (s.a.w.) Blasphemous? Sister Rukhsana Ihsan Jamshed: Why do it when it can endanger your life? Brother Terence Helikaon Nunis: That is a valid concern in places like Pakistan and India. Fortunately, I live in a civilised country. Sister Aaminah Shiah: I am torn on this one. Allah (s.w.t.) does not want us making graven images because man is stupid and tends to worship what they draw. But, the Prophet (s.a.w.) is not a god so, should drawings of him even count? I do not know. Sister Colleen Dunn: I am curious as to why you believe that man tends to worship what they draw. Sister Zoe Fletcher: Sister Colleen Dunn, years ago, long before I converted, someone told me that Muhammad (s.a.w.) had said that he did not want to become another “Jesus”, and end up an object of worship. I have no idea where the person got this information from, but it always stuck in my head. Now we have Christians worshiping Jesus (a.s.) and appearing to pray to crosses. Not that a picture would create this situation though. Sister Colleen Dunn: Yes, exactly. We cannot blame the object for our own failings. And I would question if the Prophet (s.a.w.) actually said that. People make all kinds of claims, and not all of them are true. If you go to an art museum, people appreciate the art. They do not worship it. 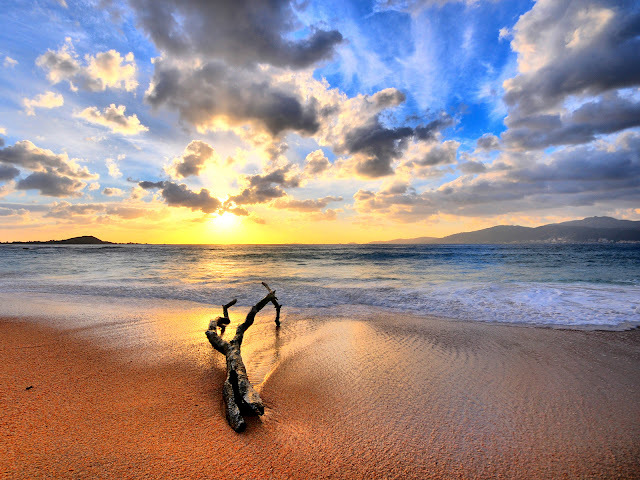 Pictures, even beautiful ones, do not automatically have that effect on people. Going to the Louvre to see “Mona Lisa” is a tourist stop, not a pilgrimage. Brother Zain Aly Trook: Sadly, there is a teaching amongst our madaris here, in my country. It is taught that pictures are haram because we will have to bring these images to life in the hereafter and that jinn also attach themselves to pictures of any lifeforms. It is teachings like this that must stop. Sister Aaminah Shiah: Pretty much what Sister Zoe said. We are not supposed to imagine am image for God because He does not have one. The pictures of Jesus (a.s.), or the prophets, or saints get that kind of attention in the minds of people. Whether they actually worship the actual picture or not, they still see this image in their heads when they pray. I think that is what God Wants us to avoid. Historically speaking, though, this has happened over and over again. Whether it is drawn or sculpted, the society worshipped it; cavemen with their paintings, indigenous tribes; same thing. Catholicism, Buddhism, Hinduism, the ancient Romans and Greeks, even Jahiliyyah Arabia - the paintings and statues permeate the religious practices of whatever society they represent. They become so much of a representation that they eventually become the god they represent. Sister Ayesha Hadi: Not blasphemous per se but, for me personally, they denote a lack of adab. Some things are sacred. Sister Gina Chowdhury: This is one of the things I love about Islam: that we remove all risk of distraction with a visual representation of a human being. Be it a prophet, this is a strong reminder that he was just a human being. Brother Amos Teo: There is a sculpture of the prophet Muhammad (s.a.w.) at the US Supreme Court together with other great lawgivers: Muhammad (s.a.w.) Sculpture inside Supreme Court a Gesture of Goodwill. Brother V'dya Vice Versa: How they know that sculpture represents Muhammad (s.a.w.) in the 1st place? Brother Gary Dargan: While Moses (a.s.) has a staff in one hand and the 10 Commandments in the other, Muhammad (s.a.w.) is depicted with the Qur’an and a sword reinforcing the lie that Islam was spread by the sword. Brother Amos Teo: The sword can also be used to chop off the hands of a thief. Brother Gary Dargan: That is the other problem. Why is shari’ah always reduced to hudud? Brother Ahmad Jenkins: Because here, in the West, that is all that is known outside secular law, so people see that perspective in shari’ah. Brother Ibrahim Underwood: It is also because that is what reactionary modernist groups reduce Islam to when they gain power. They protect Islam’s “honour” by controlling the bodies of women and “prove” they have established an Islamic social order by lazy applications of sacred law. They do not overturn injustices committed by the rich against the poor, nor take on any of the other great challenges, for example. Brother Ahmad Jenkins: It is a topic I too am torn over, but I love the classic depictions of them without faces. Brother Sri Nahar: Forget God, not even angels have forms, though they might have appeared in human guise to the prophets. Brother Amos Teo: Brother Sri Nahar, kindly point out where it is written that angels have no form? Brother Sri Nahar: It is a doctrine in Christianity - angels being purely incorporeal beings, cannot have a material form. Brother Amos Teo: The Bible mentions that the angel needed to knock on the doors of Lot (a.s.) to gain access to his house, in the chapter on Sodom and Gomorrah. The Qur’an Mentions that the angel Gabriel (a.s.) could not enter a room where there is a dog. They did not walk through walls. Therefore, angels do have a form. They cannot enter a house without an invitation. They are creatures of Allah (s.w.t.) Who Alone is Omnipresent. They may have been given various abilities to transform and reshape but they do have a form of origin as expected of a Created being, formed by the Creator. But that is only my personal opinion. You do not have to agree. Brother Hisham Mstfa: Maybe they do not have form in any way we could depict them? Brother Sri Nahar: You said, “The Bible mentions that the angel needed to knock on the doors of Lot (a.s.) to gain access to his house, in the chapter on Sodom and Gomorrah.” It mentions no “needs”. You also said, “The Qur’an Mentions that the angel Gabriel (a.s.) could not enter a room where there is a dog.” No, it does not. That is from the hadits. Brother Llewellynn Hamza: I think just to draw or to show in a movie is nothing wrong. I feel The Prophet’s (s.a.w.) concern was not to be worshiped and have statues and images throughout the world. Sort of like how Jesus (a.s.) is worshiped and prayed to. Outside of that concern of worship, I never thought it was a problem to see artistic renditions or make a motion picture of him. I feel the original intention got lost over time and taken an extreme level. Sister Zoe Fletcher: I agree, and like with so many other things, it got oversimplified and the logic was lost. Brother Llewellynn Hamza: You are right, people have this habit of making the simple become more difficult. My contention is not legal as much as it is straight personal opinion, that it would be blasphemous because it would not even come close to doing Rasulullah’s (s.a.w.) face justice, Allah (s.w.t.) Shower him and his family with blessings. Brother Jak Kilby: Given what happened with Christianity, why would you consider drawing likenesses, which would only be imagined in any case, of the Prophet (s.a.w. ), or other prophets? Surely the case of Christian iconography is a fair warning in the empirical sense? Brother Ibrahim Underwood: in fact, the earliest generations of Buddhists did not show any image of Gautama for that same reason. Eventually, they showed a pillow, then a footprint, then a faceless man, and then eventually what we see today. Brother Hisham Mstfa: Brother Ibrahim Underwood, I heard Hussein Yee say a similar thing online. I wondered whether it was just a guess or had some clear historical evidence. Brother Ibrahim Underwood: Brother Hisham Mstfa, I have seen the artwork, the pillow depiction is literally a floor cushion for sitting on in a scene, but the seated figure is absent. The footprint is another one - an outline of his foot in some, or just a stylised representation in others. But it is the same as how those that came after Isma’il (a.s.) added to the worship of Allah (s.w.t.) in the Ka’bah - incremental changes that after a few generations seemed normative, then next minute, laughing Buddhas on dashboards. Brother John Mcardle: I do not think its blasphemous. But I think the problem some have is that no one will come close to capturing the beauty of the Prophet (s.a.w. ); any pictures drawn will not be him as no one knows what he looks like. Brother Terence Helikaon Nunis: Here is a fact: there is no prohibition on depiction of the Prophet (s.a.w. ), or any figure, in the Qur’an. There are, however, specific ahadits that proscribe depictions of creature and people. The sharh, explanation, of such narrations is the concern of shirk. A such, there is no prohibition in Sunni Islam over pictures of people in history books, and in medical journals, or animals in science books and of people in books of genealogies. In Shi’ah Islam, up to the present, there are depictions of the Prophet (s.a.w.) and the Ahl al-Bayt. This is despite the fact that, traditionally, the main body of Shi’ah scholarship frowned upon it. Here is another fact: Many of the early books of sirah, the stories of the prophets, had depictions of the Prophet (s.a.w.) as well as other prophets. These were books in the time of the Salaf. Therefore, it is false to claim that Islam was always against this, or that this prohibition is the default position. As late as the 1930s, there were no issues with this. And then Wahhabism happened, and the ummah collectively became stupid. This is a depiction of Prophet Muhammad’s (s.a.w.) Final Sermon, from Imam al-Biruni’s (r.a.) ‎‎Kitab al-Atsar al-Baqiyyah 'an al-Qurun al-Khaliyyah. This is from Marie-Rose Seguy’s “The Miraculous Journey of Mahomet”, from the Middle Ages. This is a depiction of Prophet Muhammad’s (s.a.w.) flight from Makkah from 1920s, one of the most recent. This is a depiction of Prophet Muhammad (s.a.w.) 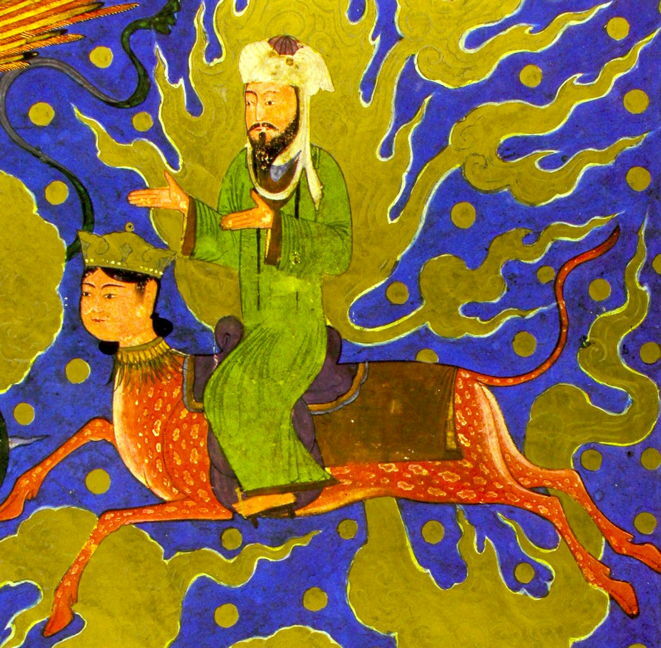 on the Buraq, from the Mughal Period. This is a depiction of Prophet Muhammad (s.a.w.) meeting Sayyidina Bahirah (r.a.), from Shaykh Rashid ad-Din’s (r.a.) Jami’ at-Tawarikh. This is a depiction of Prophet Muhammad (s.a.w.) putting back the Hajr al-Aswad, also from Shaykh Rashid ad-Din’s (r.a.) Jami’ at-Tawarikh. 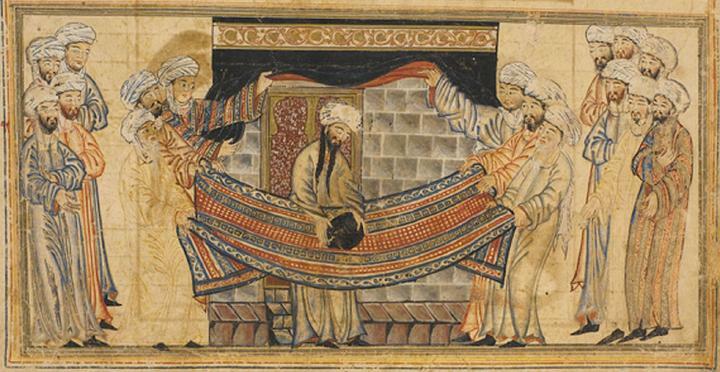 This is a depiction of Prophet Muhammad’s (s.a.w.) birth from Shaykh Rashid ad-Din’s (r.a.) Jami’ at-Tawarikh. 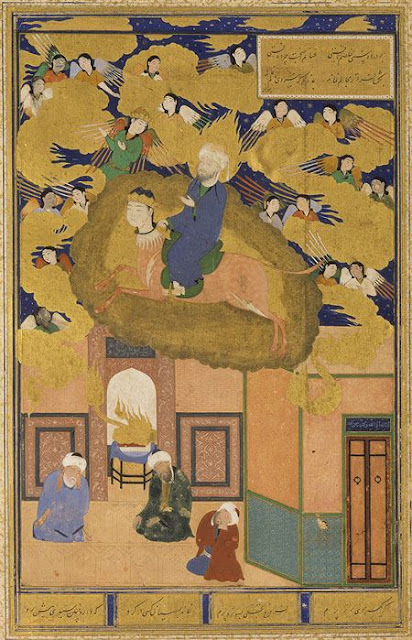 This is a 15th Century Persian depiction of Prophet Muhammad (s.a.w.) in Paradise. 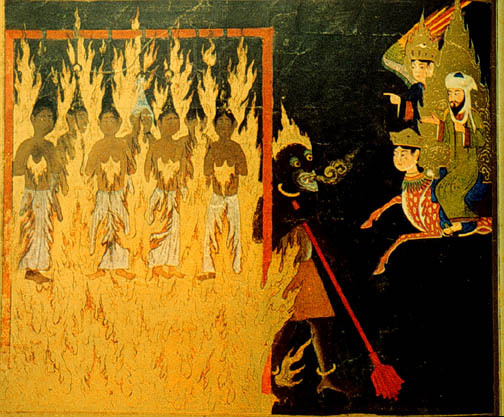 From the same manuscript, a depiction of his visit to Hell, during the Mi’raj. This is a 19th Century Persian depiction of Prophet Muhammad (s.a.w.) at al-Kawtsar. This is a depiction of Prophet Muhammad (s.a.w.) 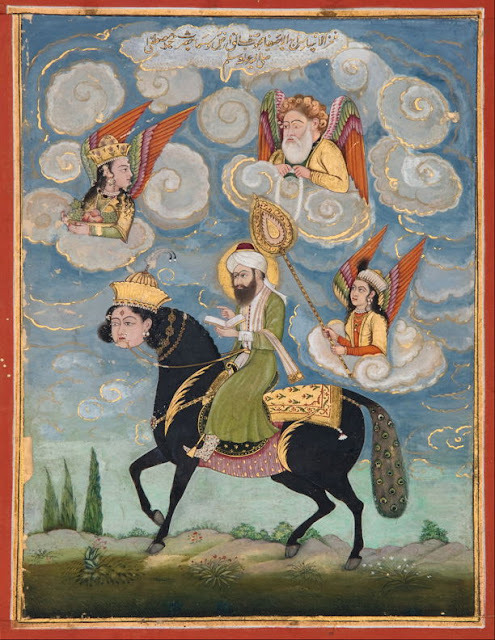 on the Buraq, from Shaykh Sa’adi ash-Shirazi’s (q.s.) Bustan. 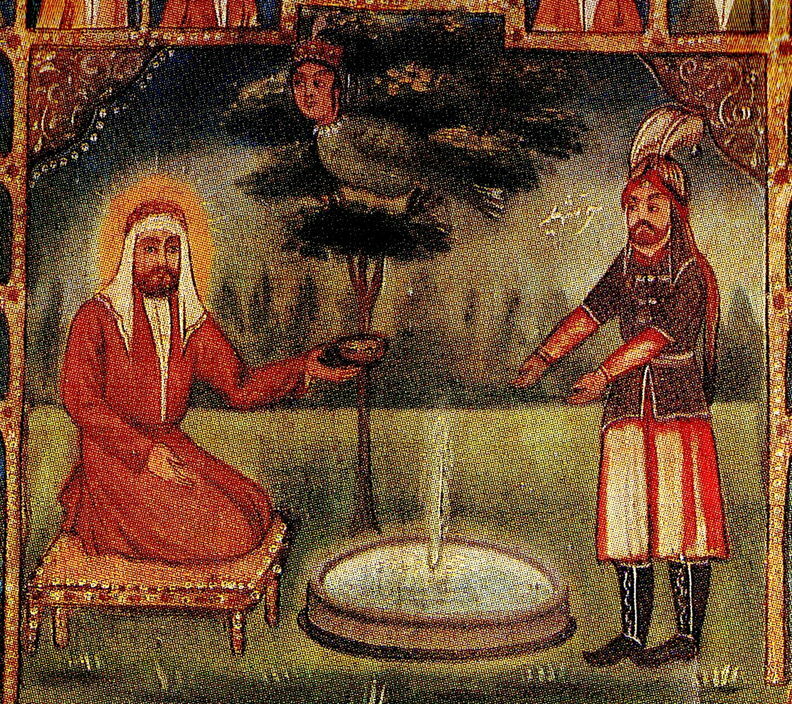 Here is an 18th Century Ottoman depiction of Prophet Muhammad (s.a.w. ), when he was presented to Sayyidina ‘Abd al-Muththalib (r.a.). And finally, this is entitled “The Charge of the Lion”, depicting Prophet Muhammad (s.a.w.) 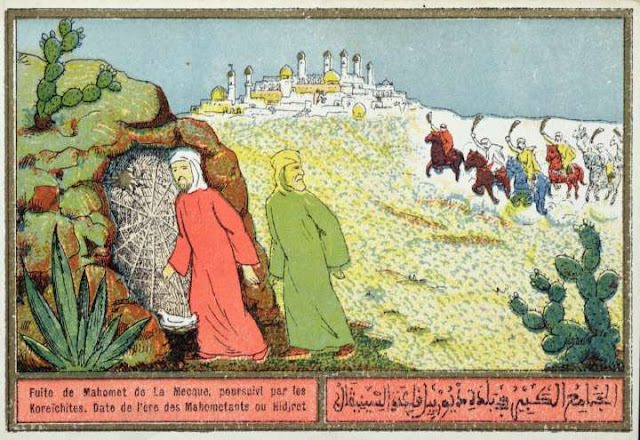 and Sayyidina Abu Bakr (r.a.) in the Cave. For a thousand three hundred years, the ummah had no problems with this. Why is it suddenly an issue now? 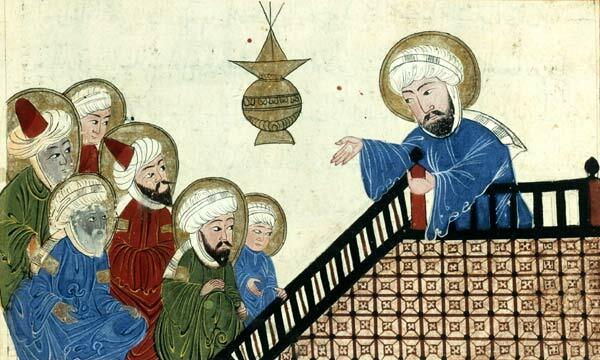 Brother Jak Kilby: So, how does that these depictions claim to show the Prophet (s.a.w. ), that any of such things are okay? It proves only that such things have been done before and likely not in every case by Muslims. Brother Terence Helikaon Nunis: Brother Jak Kilby, the description is there. 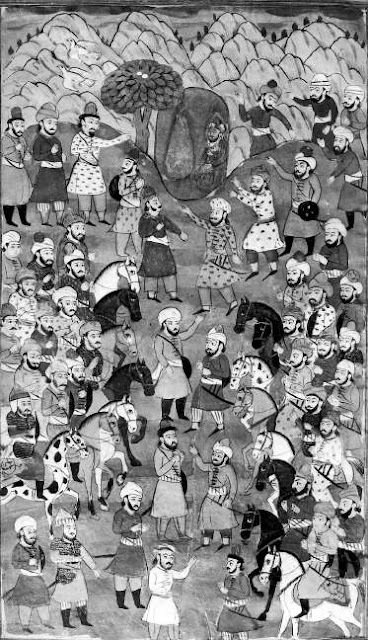 Except for one contemporeous medieval lithograph, every one of them are by Muslims, and I only gave Sunni sources for this one. So, yes, it is fine. I have no issues with depictions of the Prophet (s.a.w.). Our books of sirah used to be illustrated. Brother Jak Kilby: I have no problem with illustrations, and also have seen these originating from the earliest days. However, not of the prophets. I have seen and had in my hand Islamic manuscripts going back in time, and many illustrated; none of which have shown any Prophet (s.a.w.). This has been via work with antiquities and via an ancient library in the Sahara. Perhaps, you wish to dismiss all these as “Wahhabi”, or claim that just because you have seen “sources”, those make this allowed. Much of what Muslims do, and have done, is far from halal; surely you know that. Brother Terence Helikaon Nunis: Well, the evidence is there above that there have been illustrations, and that is was a norm. There is nothing in the Qur’an specifically against it, and scholarship has ikhtilaf on this. I hold the position of fiqh al-mu’amalah that everything is permissible unless specifically stated otherwise. Brother Jak Kilby: “Nothing in the Qur’an specifically” - does that mean you become “Qur’an only”, and dismiss ahadits and the rulings of scholars over the ages? Brother Terence Helikaon Nunis: No, it means I do not take ahadits as literal gospel. That is a Shafi’i affliction. I am neither a fan of the Shafi’i madzhab nor its methodology. And there are rulings of the scholars on both sides. Just because one side is more well-known in this era does not make it the more correct one. Brother Jak Kilby: I agree there are many differences of opinion of the scholars, from early times too. But have never read or heard of any who accepted any of the prophets to be depicted. Brother Terence Helikaon Nunis: As Imam as-Suyuthi (q.s.) said, “Denial of knowledge does not mean a denial of any clear proof.” So, your not hearing of this is not a valid argument in fiqh. Brother Jak Kilby: But if I err then it is on the side of caution, which I feel is best in such a case which would have serious implications. Brother Terence Helikaon Nunis: And you have a right to your position, and I respect that. We will agree to disagree. Brother Fadlullah Wilmot: I think this argument of erring on the side caution has been misused, as one of the fundamental principles of Islamic jurisprudence is that if it is not expressly forbidden, it is allowed. Sister Colleen Dunn: The way I interpret this is that there is no problem with the pictures themselves. If there is a problem at all, it is our response to them, which is most certainly our responsibility. No need to blame art, or for that matter the artist, so long as the depiction is respectful. Sister Zoe Fletcher: Brother Terence Helikaon Nunis, I follow your logic. Sister Saira Malik: Does anyone know what the Prophet (s.a.w.) looked like? Brother Ibrahim Underwood: There are descriptions of his appearance, some of which vary. I do not think people have paid much attention because it is not his appearance that matters, but his behaviour, his example. Sister Saira Malik: My parents and I have heard this from various sources that Allah (s.w.t.) will Ask us to put life into the pictures and sketches. Brother Zain Aly Trook: My sharing and personal account. I fell in love with Nabi Muhammad (s.a.w.) from a very young age, not by virtue of my parents, or the slave drivers at madrasah. It began when I heard certain forms of Arabic nasyid dedicated to Nabi Muhammad (s.a.w. ), and the love that those words are recited with. I thought that nothing sounded more beautiful. I still do until this day by the way. Then, I visualised being in Madina with an aroma of incense in the air, listening to the adzan alone whilst fixated on the green dome. Then, I visualised a man whose actions, voice, and words, and manner is second to none, a man that I could love 100 times more than my mother. A man who is the reason I believe in the oneness of Allah (s.w.t.). I could write and write about this, but words will never describe this feeling within. In my case, a picture will not do justice to what I feel, and the fact that such a love can be felt for someone that I still have almost zero visual reference for is proof of Divine Love and is indeed a miracle on its own. I have absolutely no problem with anyone who may find a picture that ignites a great love for Nabi Muhammad (s.a.w.). Allah (s.w.t.) is Most Merciful and there is no greater lover of Nabi Muhammad (s.a.w.) than Him. Brother Terence Helikaon Nunis: That is not how ahadits work. Simply putting up a truncation of a translation without the context does not make it a ruling. Anybody can take a hadits from any book, to justify all sorts of things, from slavery to murder. And that is how groups like ISIS work. There are a series of ahadits in Swahih Muslim that state the people who draw pictures will be Asked, on the Day if Judgement, to bring them to life, and being unable to, will be Sent to the Fire. That is not the same as saying all painters regardless, who make pictures will go to Hell, Mohammed Rehan. We are not Wahhabis; our religion demands intelligence. In the field of ahadits, we must consider the sharh, explanation. In this case, Swahih Muslim is a sort of risalah or kilab, similar to a juzu’. There are two definitions of juzu’. 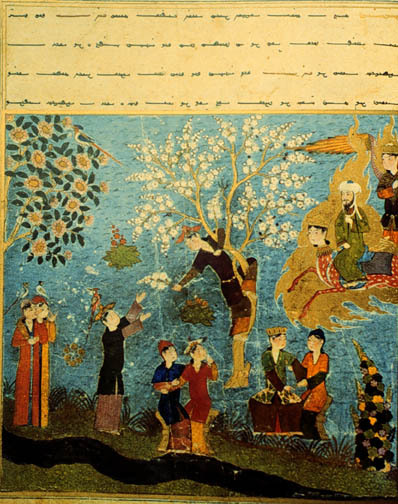 The first refers to collections of traditions passed down on the authority of a single swahabah or tabi’in, which were then further developed into masanid. The second definition refers to a collection of ahadits pertaining to a single subject. However, the rasa’il are more specific in terms of subject matter. They are collections of ahadits pertaining to one of eight topics. They are belief and dogma, ‘aqidah; legal rulings, ahkam, piety, ascetism and taswawwuf, ruqaq; etiquette, adab; exegesis and commentary of the Qur’an, tafsir; history, tarikh and sirah; crises, fitan; and, appreciation and denunciation of persons, places and events, manaqib and matsalib. The rasa’il are also known as kutub. Many of the works of such scholars as Imam Jalal ad-Din as-Suyuthi (r.a.) and Imam ibn Hajr al-‘Asqalani (r.a.) belong to this category. Swahih Muslim is classified as a muswannaf. The muswannaf are large collections of ahadits that pertain to most, or all of the categories of rasa’il. The ahadits are put together and arranged in various books or chapters, each dealing with its particular topic. In essence, it only lists the matn and the narrator with no examination of the matn, the sanad, the silsilah or the manaqib. That is not what it is for. The most famous exegesis of Swahih Muslim is Sharh Swahih Muslim by Imam an-Nawawi (r.a.). If we take these ahadits as blanket prohibitions, then the religion becomes ridiculous. That means no pictures of any kinds, no bestiaries, no books of natural history and science, no books of medicine and anatomy, and no books of travel and culture. In the current age, that means no form of documentation, no identity cards, no passports, no pictures or photographs of any kind, no videos, no television, no cinema, no documentation and no videoconferencing. Obviously, this is not what these ahadits mean. That would be ridiculous. The context of these ahadits lie in the creation of idols and iconography, which is part of shirk. This is echoed in the ahadits on idol makers being asked to bring their idols to life. So, please, we should desist from this kind of stupidity. Misquoting ahadits is the greatest fitnah of this ummah. Brother Neuman N. Nazir: Brother Terence Helikaon Nunis, you might want to read up on Dr. Henry Corbin, who tackled this issue: Ya Ali Madad: The Rationale for Praying to God & Calling upon the A’immah in Prayer. What is the difference between an idol and an ayah or icon? They are easily conflated as the same thing by the unthinking, unsophisticated and, sadly, all too often sectarian minds. Because Islam is anti-Christianity, ergo Muslims cannot do this is the reasoning and yet ancient Christians prayed 5 times a day. So, what is the difference between an ayah/icon and an idol? An idol is when matter in itself is worshipped. As the Midrashic story of Abraham in Surah al-An’am lets out. In contrast, an image, an icon, a tselem, an ayah is a both a portal to higher realities and a manifestation or mazhar of higher realities. The Qur’an Establishes this distinction. The Qur’an is composed of ayat, and presents itself as the ideational vision of the cosmos, a cosmos that is the ayah of the Divinity. When matter is worshipped you have materialism. When matter is a portal to the Divinity. This is a nuance that Wahhabi black and white thinking often fails to grasp. And yet, this is the very heart of tawaswswul. An ayah can be a book as the Qur’an highlights, and it can be a prophet, sage, imam, and anyone or anything else that serves as a portal to the Divinity. Confusions on these matters stem from the loss of the distinctions between the Hahut, the Transcendent Godhead; Lahut, the manifestations of the Divine Powers, the Names and Attributes; and the Nasut, the one transfiguring the Names and Attributes. Tawaswswul is ultimately about having a verifiable bridge to the Divinity because the Nasut is the bab or gate of the Names and Attributes, the Lahut. We see a similar scheme in the gospels where the Father is the Divinity, Hahut; the Holy Spirit is the descending Names and Attributes, Lahut; and the Son is the transfiguration of the Names and Attributes, Nasut. Brother Terence Helikaon Nunis: I fail to see how this is related.